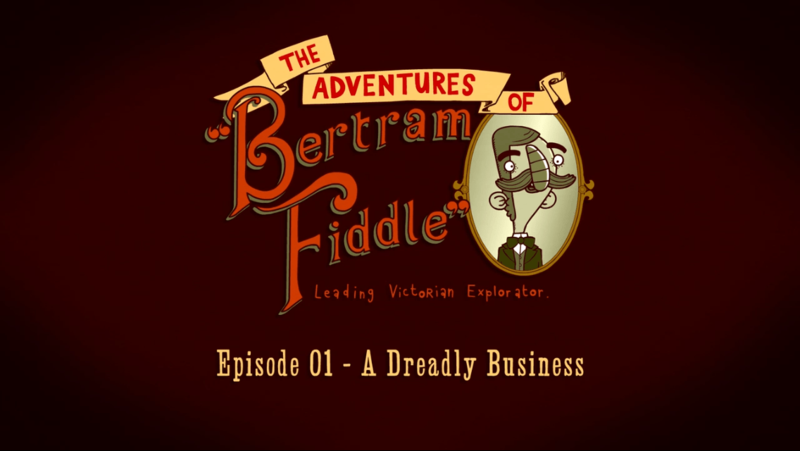 I’ve been following news about the Adventures of Bertram Fiddle for a while now, and lucky for all of us, the first episode is finally out! 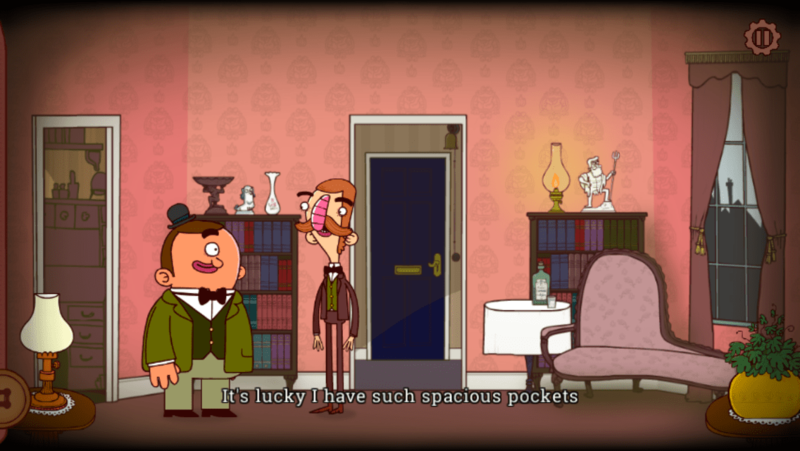 For those of you who haven’t heard of it before, Bertram Fiddle is named after its main character, the self-proclaimed “leading Victorian explorator” (he likes to use made-up words). Bertram hasn’t been able to find any adventures to go on in quite some time, and his wife, Wortha, threatens to make him work at a regular old boring job because “caviar doesn’t grow on trees.” But, as luck would have it, he literally stumbles into an adventure! 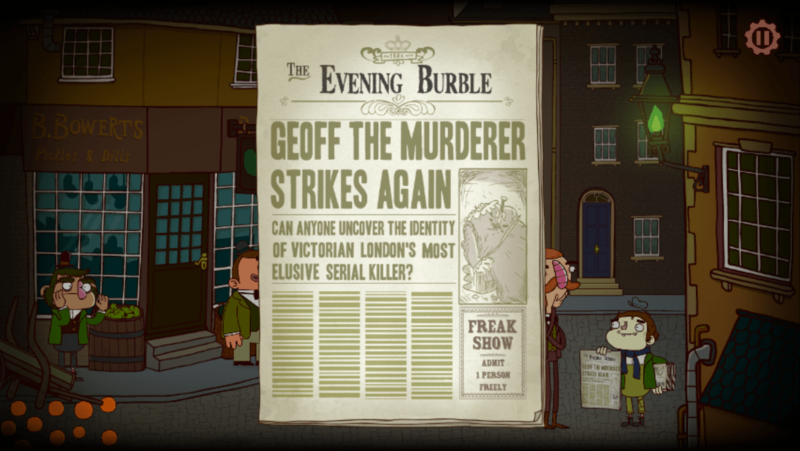 Quite accidentally, Bertram finds himself on a hunt through Victorian London for the mysterious and elusive Geoff the Murderer! 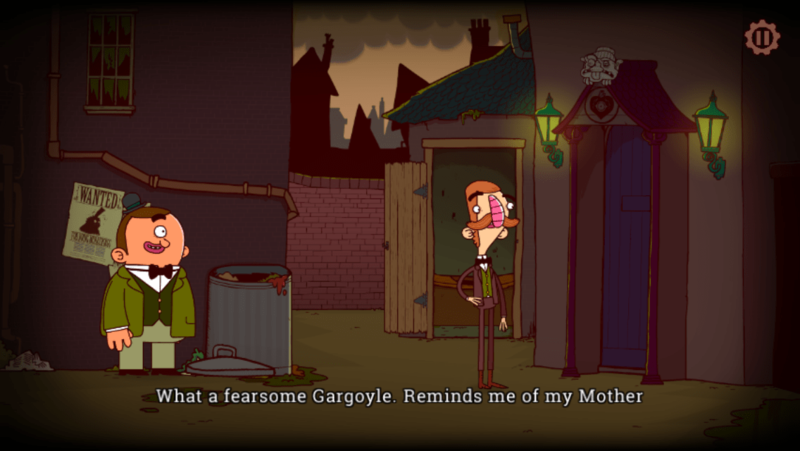 If you’re familiar with third-person point-and-click adventure games, you’ll feel right at home with Bertram Fiddle. Your mission is to find and pick up objects (anything that isn’t bolted down), which are stored in your inventory. Then you explore your surroundings and talk to characters for clues of what you should do next and how to use the items you found. 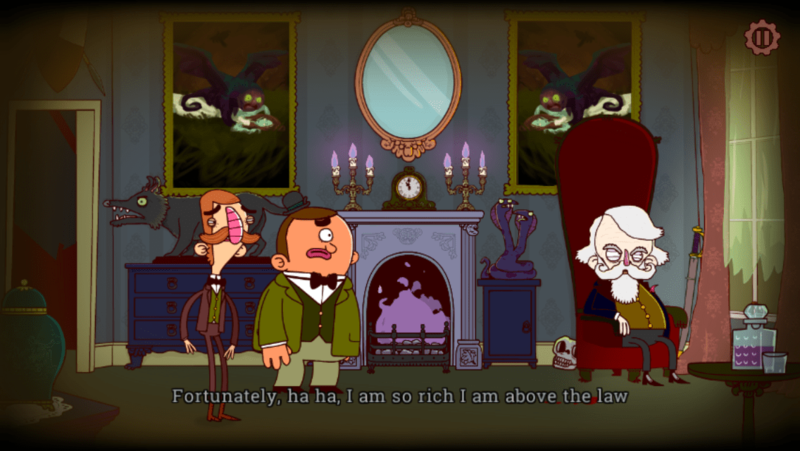 While you’re doing so, you’ll be treated to a humorous story with fully voice-acted dialogue. 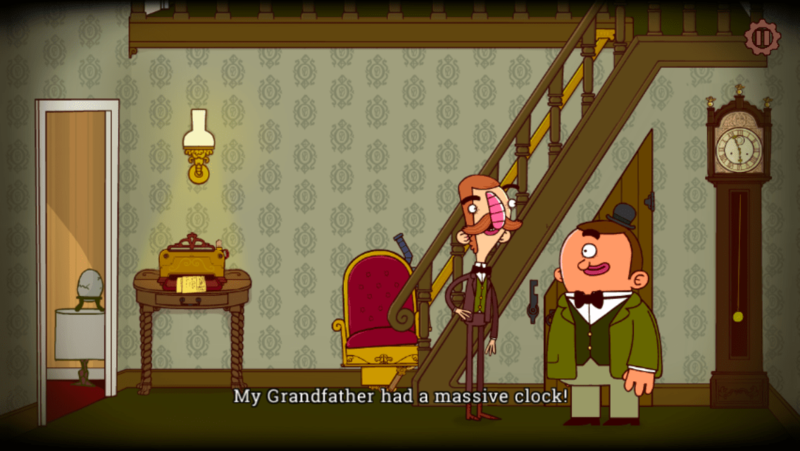 Bertram talks you through everything in his slightly irritating but endearing voice. Anything you tap on will illicit a clever description or hint as to what you should do next. There are also subtitles that can be turned on or off for those who prefer to read along with the script. I really loved the voice acting, and the game wouldn’t be quite the same without it. Imagine having to hear names like “Lord Arthwipe” spoken only by the voices in your head instead of the voices in the game! Oh, the horror! You’ll encounter a full cast of quirky yet lovable characters, many of whom do questionable things that keep the game from being 100% family-friendly. Some of the things these developers have come up with are so out there, you might feel inclined to recommend a good therapist! Bertram isn’t necessarily lazy (ok, maybe just a bit), but he is scrawny, so he enlists the help of his assistant, Gavin the not-so-scary cyclops, when he needs some muscle power. This adds a little variety to the puzzles, as well as some extra humor to the story. 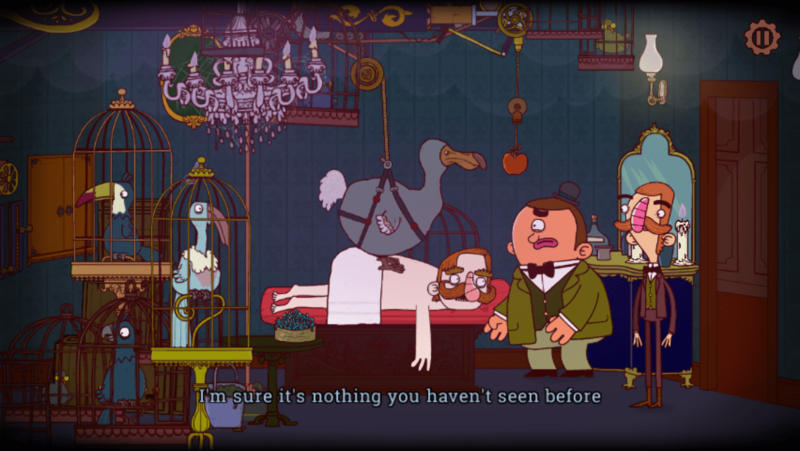 I’m happy to report that there are no hidden object scenes in Bertram Fiddle. This is click-and-point adventure gaming in its purest form. The only mini games to be found are a couple of scenes where you have to navigate around obstacles to chase or outrun someone. Most people shouldn’t have any trouble with them, though. 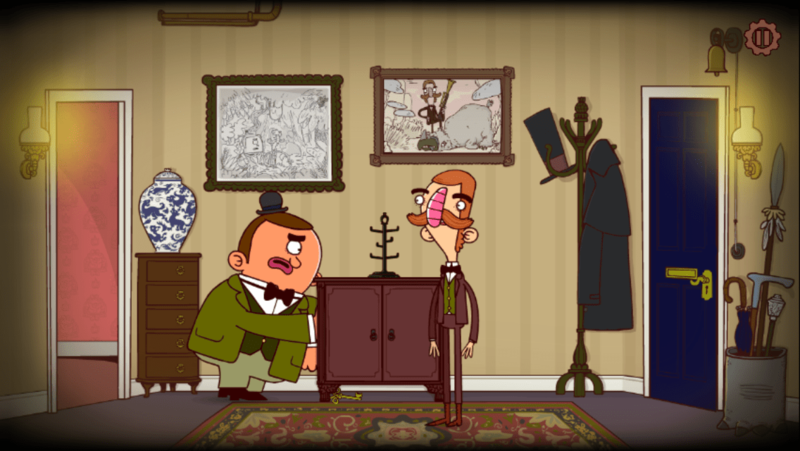 Bertram Fiddle won’t offer any brain-busting puzzles, but what it lacks in challenge, it more than makes up for in charm. If you like story-driven games with off-beat, dark humor that can laugh at themselves, you really can’t go wrong with it. Sadly, this is only the first episode, so you will have to wait to see the ending. But the developers have packed quite a bit into this first part. There are so many little jokes and jabs to discover, that you’ll want to examine every nook and cranny. There are even some Doctor Who references for those with a keen eye. On my third playthrough, I noticed things that I missed the first two times. And if all goes well, the developers hope to give Bertram many more adventures so he doesn’t have to work in a soap factory! If you’re already playing the game and get stuck somewhere, try my step-by-step walkthrough. I thought this was very well done. Not so hard that you got really frustrated & not too easy either. The humor was awesome. I can not reccomend it enough. It’s is everything I had hoped for & more.